11/2/2009Share this story on Facebook! The Onion sent writer Seth Reiss to Ithaca College to present some of the satirical newsweekly's best headlines and provide the Ithaca community with some comic relief. The Onion is both a print and online news source, which is known for its comedic news reports on current events. The stories are meant to "mock mercilessly the left and the right, the powerful and the weak, the deserving and the utterly innocent." 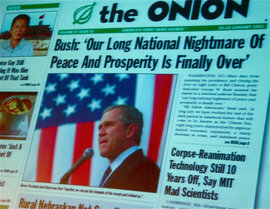 Before he showed headlines, Reiss claimed most Americans get their news from the Onion. He then went on to show headlines, and even called a student up to help him read a story. The event was hosted by the Student Activities Board and co-sponsored by the Park Center for Independent Media.